Tylenol is brand of pharmaceutical products developed and marketed by McNeil Consumer & Specialty Pharmaceuticals. All Tylenol products contain acetaminophen, a pain reliever. In addition to acetaminophen, Tylenol PM includes diphenhydramine HCl, an antihistamine. Tylenol PM is marketed as a pain reliever and sleep aid. Both of Tylenol PM's active ingredients can cause long-term side effects. Acetaminophen has a well established history of causing both short-term and long-term liver damage and failure, especially if taken in higher-than-recommended doses. The U.S. Acute Liver Failure Study Group revealed that acetaminophen toxicity is related to about 50 percent of all acute liver failures in the U.S. In addition, the group claims that acetaminophen overdose is the leading cause for calls to Poison Control Centers and accounts for more than 450 deaths per year. Drugs.com notes that several cases of long-term liver toxicity from acetaminophen use have been reported, despite the users taking less than the maximum adult daily dose of 4,000 mg. In a clinical study reported in a 2006 Journal of the American Medical Association, nearly 40 percent of otherwise healthy adults who took 4,000 mg of acetaminophen for two weeks were found to have liver damage as evidenced by abnormal liver test results. Long-term risk factors for acetaminophen related hepatotoxicity, regardless of dosage, include concurrent alcohol and medication usage, hepatitis and fasting. Acetaminophen also has a well established history of causing long-term kidney damage and failure. The "PDR Guide to Drug Interactions, Side Effects, and Indications" cites a study published in a 2001 New England Journal of Medicine that reported long-term acetaminophen use was associated with an increased risk of end-stage kidney disease. Approximately 8 to 10 percent of the patients on acetaminophen developed end-stage kidney disease. Another cited study conducted on 1,700 women that lasted 11 years, showed that about 10 percent of the women suffered kidney injury while taking acetaminophen. Women who took between 1,500 and 9,000 tablets over that time increased their risk of kidney injury by 64 percent. As noted, Tylenol PM also contains diphrenhydramine HCl, and although its interaction with acetaminophen within the body is not well understood or documented, studies have been conducted on long-term use of diphrenhydramine alone. 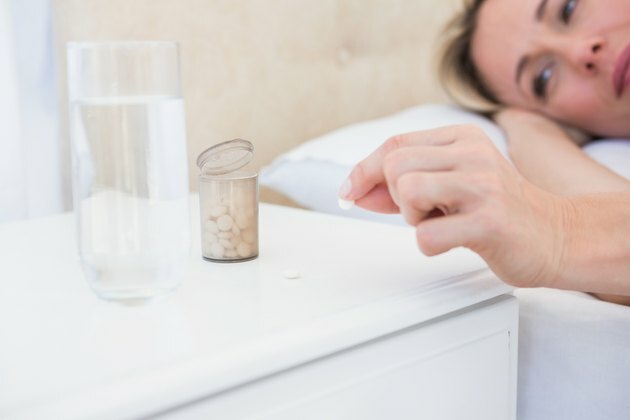 Drugs.com notes that hypotension, insomnia, photosensitivity, hemolytic anemia, reduced coordination, reduced cognitive capacity and tinnitus are all potential long-term side effects caused from diphenhydramine use. The only long-term studies of diphrenhydramine have been conducted on the elderly, so the fact that cognitive side effects were reported most often might be related to normal mental deterioration with aging.